For many, a university education would be impossible without a student loan to help meet the steep living costs of studying full time. 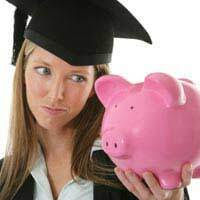 For the most part, receiving a student loan means that undergraduates are able to focus their time and attention on lecture rooms, libraries, bars and the cafés, relieving the strain of financial worries. Sometimes, however, individuals experience difficulties in applying for, or delays in receiving, their loans. So, what happens when it all goes wrong? We caught up with Shelly Asquith, a 19 year old from Essex, to hear about her student loan nightmare. Q. What was the problem with your student loan? A. It didn't come through in time, and was incredibly difficult to apply for in the first place. My mother, who I live alone with, has been out of work due to illness for a long time. As she was not fit to complete the countless, compulsory Student Finance Sponsorship forms herself, and is not waged per se, applying for a Means Tested Loan was easier said than done. But, after numerous exchanges with Student Finance and Job Centre contacts, I did manage to complete my application on time. But come September, I’d had no formal confirmation of my loan and grant. Q. How did the problem affect you? A. Initially I was stressed and anxious; I’d already moved into halls, but couldn’t find the money to pay the rent. Furthermore, the university were requesting a £700 down payment for my tuition fees. With no savings, this would have taken my overdraft to the limit. There was no way I could pay both, and since I could only move out of halls once I’d quit my course, that’s what I did. I moved back home, and got a job. Q. Do you know how many others were affected? A. I don’t know of any other students who were forced to leave uni altogether, but many of my friends were left stranded for months without a loan. Most were lucky enough to have savings and parents that could tide them over. Q. What steps did you take to remedy the situation? What power did you have and what help was available? A. I wrote to the student services department at the university, who offered me an emergency loan of £500. That was a start, but not nearly enough. Other staff I spoke to were sympathetic, but not helpful. Speaking to student finance (when I could get through, at least) proved useless. I was continually told that my details were ‘still being processed’ and that ‘I will get my loan... eventually’. I felt pretty powerless, to be honest. Q. What did you do the raise the profile of the problem? A. Once I moved back home, I wrote to a couple of journalists. The BBC took a particular interest, and education correspondent Sarah Campbell interviewed me a couple of times for the news. She said they’d heard from thousands of students who’d had problems with their loan payments. Q. How have you been spending your time this year? A. I’ve been very lucky finding work. Two days after moving back home, I was working for Social Services. Since then I’ve worked at my local council’s press office, have written articles for various publications, and I’m now at a lobbyist group.In hindsight, this has been a really productive year; I’ve gained lots of experience and saved up some cash. Q. What is your plan for the future in terms of university? A. I am planning to enrol at the same university later this year, for the same course. I’ve applied for my loan, so fingers crossed! Q. Are you planning to work part time whilst at university? A. Absolutely! I’ll be looking for work during holidays, too. Q. What did you learn from your student loan nightmare? A. To look on the bright side; out of bad can come good! Of course, Shelly’s experience was unusual in the dramatic impact it had upon the direction her year took. Her positive actions, however, could be adopted by anyone experiencing difficulties or delays when it comes to their student loan. In contacting the relevant authorities, seeking advice from those in the know and raising awareness on a national scale, Shelly took confident steps towards fixing both her funding fiasco and those of others. Hi there, We are a group of student journalists who are interested to use such a case study for our project. Please if you read this and you think you can help out, email me at n.asad1@arts.ac.uk Many thanks!